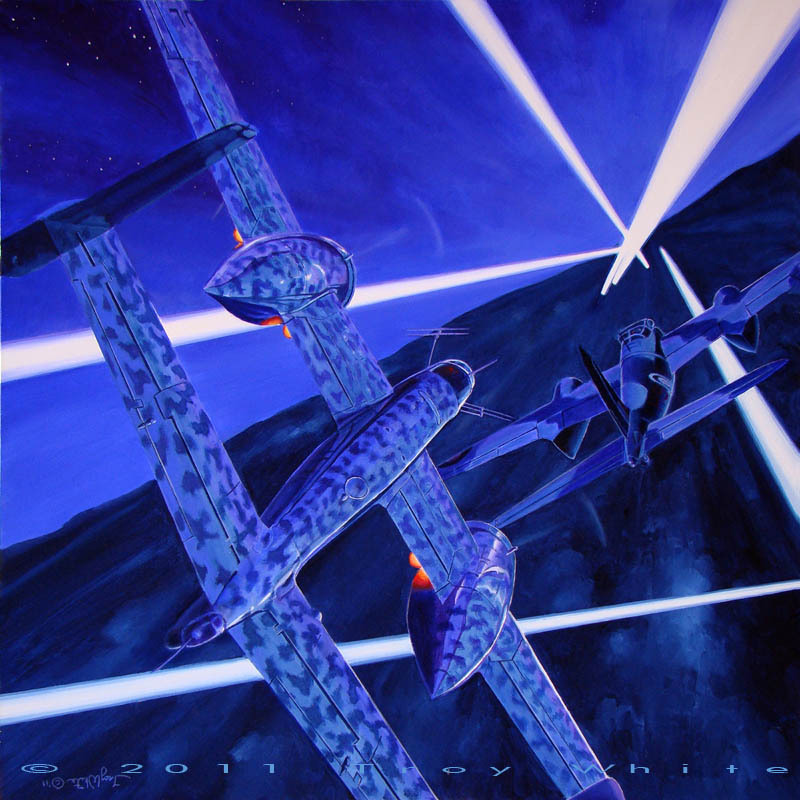 "Helden der Nacht " Oil on Canvas 32" x 32" © 2011 Sold. At 11:23 PM on the night of May 6/7 1944, Oberleutnant Werner Baake of 2./NJG1 flying an He 219 shot down a Mosquito from No. 109 Squadron RAF 1km NE of Herkendorf for his 29th kill. His victims that moonlight night were Squadron Leader Harry Bernard Stephens DFC and F/L N.H. Fredman DFC. Both RAF flyers were KIA. 109 Squadron was part of 8 Group and was one of the first squadrons of Bomber Command's Path Finder Force. In late 1942 it was equipped with "Oboe". Stephens had flown on the historic first Oboe sorties to be carried out over enemy territory. Bomber Command dispatched five Mozzies to Leverkusen Germany on the night of May 6/7 1944. Stephens and Fredman were the only losses that night. The He-219 Uhu (Owl) is thought by some to be best combat aircraft of World War II. As with other Nazi aircraft developments the Heinkel He 219 Uhu suffered from political infighting and nepotism with respect to the awarding of contracts. The He 219 was conceived as a multi-purpose aircraft similar to the role played by the more numerous JU 88 but saw service only as a heavily armed night-fighter. With a top speed of 415 MPH and a ceiling of 40,000 the Owl was one of the few Luftwaffe aircraft able to intercept the British Mosquito which had the same top speed and a slightly lower service ceiling. In terms of design features the He 219 incorporated advanced technology that was ahead of its time. It was the Luftwaffe's first operational aircraft with tricycle landing gear. The proximity of the propellers to the cockpit required that the He-219 be equipped with ejection seats. It was the first aircraft to utilize them them in combat. 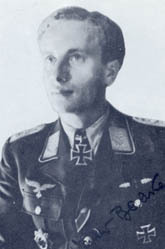 In 195 combat sorties Werner Baake scored 41 victories. At least nine of his kills were achieved while flying the Heinkel He-219. He was born on 1 November 1918 at Nordhausen Germany. Baake was posted to I./NJG 1, based at Gilze-Rijen in Holland, on 21 November 1942. August 1943 found Baake flying with 3./NJG 1 based at Venlo in Holland. by the end of 1943 Baake was an ace four times over with a score of 23. On 22 January 1944, Baake was appointed Staffelkapitän of 2./NJG 1. On 22 January 1944, he was appointed Staffelkapitän of 2./NJG 1. He shot down a RAF Lancaster four-engine bomber over the Urft Dam on the night 27/28 January to record his 24th victory. In doing so Baake’s Me110 was mortally wounded by return fire from the Lancaster. 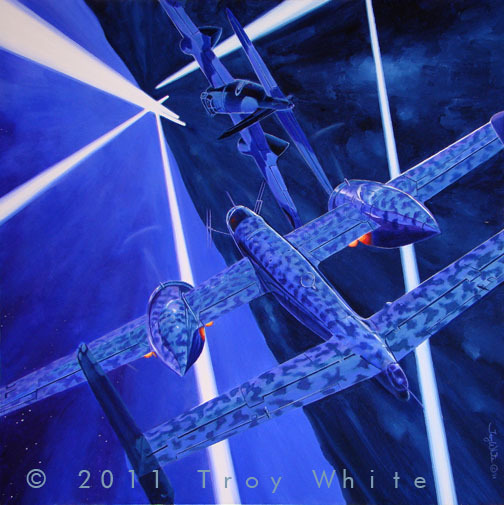 He and his crew were forced to egress from the stricken fighter. Baake survived the jump unharmed but his radio operator Uffz. Waldbauer was killed. 2./NJG1 was partially equipped with He 219s and on 6 May 1944 Baake shot down the 109 Squadron Mosquito of S/L Stephens. He was awarded the Ritterkreuz on 27 July for 33 victories. Baake was promoted to Gruppenkommandeur of I./NJG 1 on 2 October 1944, after the death of his predecessor Major Paul Förster who was killed the previous day. Werner scored a triple on the night of 5/6 January 1945 bringing his score to 41. They were his final victories of the war. After the war Baake found work flying with Lufthansa Airlines. He was a captain in 1964 when he was killed in a training accident while flying a Boeing 720 jetliner. The Boeing took off for a routine training flight from Wuerzburg-Ansbach at 09:33. The crew reported reaching 13,000 feet at 09:38. The IFR flight schedule was abandoned and the crew continued VFR to carry out some training manoeuvres between VOR Kitzingen and the Roethenbach beacon. A complete roll was flown, but while attempting a second roll, the plane went out of control in the inverted position. The Boeing became overstressed and disintegrated in flames.